I can remember walking across the parking lot of the Northgate mall after seeing Chinatown at the Northgate theater in 1975 (this was a giant single-screen theater, in the days before people needed to use the term “single-screen”). 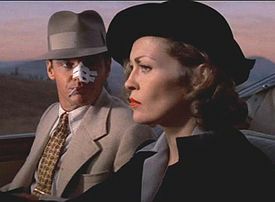 There was nothing notable about the parking lot, or the warm afternoon, but you remember the layout of the landscape after something definitive has happened, and seeing Chinatown as a teenager was one of those definitive movie-watching experiences. We were talking about the ending, which somehow, even though the movie was set in the 1930s, seemed to sum up something about living in the exhausted Age of Apathy. For years, among my friends, the phrase “It’s Chinatown” could be inserted into a conversation as a shrugging piece of wisdom or a sardonic punchline. It’s a complete movie on every level. And it’s the best film of a strong year, a year that had the era’s signature filmmakers going full blast (Fassbinder, Altman) and giants contributing unique works (Bresson, Welles). Not that there was any doubt about #1. Not sure what to do with Richard Lester’s Four Musketeers, since it connects to Three Musketeers – which came out in 1973 – but taken together the whole thing is glorious. (Lester had the wonderful Juggernaut in ’74, too.) And Amarcord is one of Fellini’s best late films, and A Woman Under the Influence is Cassavetes at his most bearable … but there are only ten slots. Well, twelve, in this case. Lancelot is the least accessible Arthurian movie ever made, but its rigor is in service to a terrible beauty, whereas Celine and Julie is the kind of movie that seems to open new and playful doors with every scene. The American films catch life in the U.S. of A. with an unblinking eye, a truly jaundiced view of how things work. And the Fassbinder titles show a director with complete confidence in every shot, whether he’s surveying the frowzy underlife of immigrant West Germany in Ali or the strict, frosty social codes of Fontane’s classical novel Effi Briest. He also did the wickedly hilarious Martha that year. Incredible. Weird time. Euro-arthouse sensations such as Swept Away and Going Places were entering the movie-stream at the same moment as Ground Zero provocations like Texas Chain Saw Massacre and It’s Alive, and they all look like part of the same vitality. And Mel Brooks did Blazing Saddles and Young Frankenstein. When the Western spoof of Blazing Saddles rips open to reveal a Hollywood backlot, it was just as strong a signal as anything Altman or Scorsese did to announce that the inmates had taken over the Hollywood asylum. I love this list for the inclusion of The Parallax View. This is one of the great paranoia thrillers of that decade, but one that a lot of people don’t seem to know about. I might have dropped The Godfather Part II in favor of Coppola’s other great movie of 1974 – The Conversation – which for me feels more personal, and contains Gene Hackman’s most memorable performance. What a great year – definitely better than 1939, in my book.